Maybe you should come to Williamsburg to see the W&M president - hes Halloween all year long. An unkempt, overweight guy who doesnt know how to tuck his shirt in or that ties exist. He knows secret handshakes and how to buddy up to the students, but is a complete slob. No matter the venue I see him - fancy restaurants, arts festivals, football games, etc. - I am invariably dressed better than him. Is this the future of college presidents? Put on a blazer and tie every now and again! Um, I think you are simultaneously missing the point and taking things far too seriously. First, from what I recall, one of the primary ideas behind the Halloween masquerade is that people dress up as someone or something that is evil, scary, repulsive, disgusting (Examples that I can think of include Darth Vader, Satan, pirates, and the little robot girl from the short-lived tv show "Small Wonder"). Surely the terror-fighting keyboard commandos at NLT would not argue that all of those words (and more) apply to terrorists? So, whats really the problem, whats really the issue here? I dont know anything about this college president; are you or the blog you linked to just looking for an opportunity to attack her? Thats just a guess. Secondly, arent the Left supposed to be the ones to try to politicize EVERYTHING, even forcing their political analyses and "political correctness" on a group of people trying to relax at a Halloween party?? An obvious question: would Gutmann have posed with a guest--or even allowed him into her house--if hed dressed as Adolf Hitler or a Nazi SS officer? A KKK member? Hey, I seem to remember one of Englands princes dressing up like a Nazi not long ago...and being tarred for it in the press. Perhaps some costumes are just a little too evil/disgusting to be tolerable? Well, since I know nothing at all about Gutmann, other than the fact that she posed for that one picture, Id have to answer that I dont know at all what shed do. Do you know? Maybe someone should just ask her. I can say that I personally would pose with someone dressed as a Nazi, a Klan member, a terrorist (hey, anyone remember Osama bin Laden? ), or the little robot girl from the now-defunct tv show "Small Wonder." I answered your question; here are a few for you. Wasnt your question, "Do you really think its a good idea to host a Halloween party and pose with someone dressed as a suicide bomber?" a rhetorical one, with the implied answer for readers being "No, its a bad idea"?? Do you think that a college president should not pose w/ someone in a terrorist costume but should welcome someone to the party in a Nazi costume? Thats NOT a rhetorical question on my part. Hopefully its clear that my position is that all of those costumes are fair game. Do you not agree that a standard aspect of the Halloween masquerade has been to dress up as scary, loathsome people and things? If Satan, the Prince of Darkness himself, is an uncontroversial constume at this point, then why should there be any fuss made when someone dresses up as such a widely-hated figure like a suicide bomber? I know thats five questions to your one, so if youre not willing to answer all of mine, let me select the first two or three as those Im most curious about. Thanks. This story seems to be about (1) bad taste, and (2) making virtually everything public and instantly so. One answer to Myers question is: this was a college presidents party; even college presidents can have friends with bad taste; and yes, Amy Gutmann would have drawn the line at a Hitler or an SS outfit. What do we conclude? I conclude that a world this nosy is a world that assaults our sense of proportion and diminishes us all. I have an easy answer for the first couple of questions. Everything a college president does in her capacity as president (which includes hosting this Halloween party) ought to considered in the light of what message it sends about the institution to various constituencies. What she would or wouldnt, should or shouldnt, do in a private setting is indeed irrelevant. That said, I dont think educational institutions should "welcome" people posing as terrorists (let alone, of course, actual terrorists, which remains a risk in higher education on both sides of the Atlantic). Im guessing that Gutmann wouldnt feel comfortable posing with a "Nazi," nor would I, either in a private or a public setting. I agree that "a standard aspect of the Halloween masquerade" is as you say, though thats one reason Im ambivalent about the entire enterprise. To make an entirely uncontroversial Platonic point, conventionally decent people ought to have a hard time dressing up like thoroughly indecent people. Well, Mr. Knippenberg, I guess you dont do Halloween As She Is Done. If you can pose next to Satan, or Freddy, or Jason, you can pose next to a suicide bomber or a Nazi. I dont mind the pictures of the college president with the dressed up suicide bombers, although it is tacky. Well, then, it sounds like you (and maybe Win) might be upset that Gutmann was simply hosting a Halloween party of any sort in the first place. Might we see the same outrage if shed posed with a kid dressed up as Beelzebub? You said "Everything a college president does in her capacity as president (which includes hosting this Halloween party) ought to considered in the light of what message it sends about the institution to various constituencies. What she would or wouldn’t, should or shouldn’t, do in a private setting is indeed irrelevant." DID Gutmann host this party "in her capacity as president" of the univ.?? At the link you provided with the pics, Myers wrote "University of Pennsylvania president Amy Gutmann threw her annual Halloween costume party at her home Tuesday night," which certainly doesnt make it sound terribly official. Was this even a campus function? Should she have posted a sign saying "No Halloween costumes that might upset anyone!"?? To linger a moment on your "entirely uncontroversial Platonic point" that "conventionally decent people ought to have a hard time dressing up like thoroughly indecent people," would that extend to actors portraying, say, slaveowners or Hitler in documentaries about them, or maybe in satires lampooning them? This take on Gutmanns party strikes me as another example of the Right conflating portrayal/depiction with approval/endorsement. I agree with Craig. Strapping explosives to ones body is an important part of Middle Eastern culture. I dont think we should be so quick to judge them according to our standards. I hope you dont impart your twisted sense of logic to your students, Cameron, as thats just about the lamest straw man misrepresentation of my words that Ive ever witnessed here...and thats saying something! When you read of this enterprise (note the slideshow of costumed participants) do you also think that these "conventionally decent [you would consider them to be such, I presume] people ought to have a hard time dressing up like thoroughly indecent people"? I said that they ought to have a hard time, not that they couldnt. Without knowing anything about the church or its membership, Id guess that they are doing it for what they regard as a good cause. Come on, this is silly. The president of any university has certain responsibilities whenever she is in the company of her students. Among these responsibilities would be exhibiting some form of prudence. Being at war with a group of people that take the lives of both innocent (Im guessing that is not a controversial term) contractors/media/citizens as well as our soliders, it would appear both unwise and imprudent for her to pose in a picture with students who are dressed as the enemy and acting out executions that have struck so many Americans so deeply. Compared to your other examples, I would second Debs opinion about the "cartoon" character the devil has taken on in popular culture, and Hitler, disgusting as he was, is at least not actively continuing his horrible atrocities today, being dead and all. I would also argue that posing with students reading from the Koran (?, it looks like those little green New Testament bibles evangelicals are always handing out at campuses across the country) before executing a "hostage" is very likely offensive to the majority of the Islamic world that do not condone and fight against the radicals that so interpret the Koran. Thanks, Fred, for bringing this rotting corpse of a thread back from the dead. Its the Zombie Thread of the Right-Wing Blogosphere!!! Run for your lives!!!! But youre right, it is silly. Gutmann should have given that kid several CIA-style dunks in the apple-bobbing barrel for getting that snapshot taken with her (but if you check her ghoulishly lame response she claims that the pic was clicked before she realized what he was dressed up as; but she assures those of you in outrage mode that she was "offended" by the costume!). Nothing makes for a great Halloween party like a university president on "prudence" alert! "Additionally, we strive for all societies to instill healthy non-violent values." Hold the phone!!! Hes starting to sound like a dangerous traitor! "I would also argue that posing with students reading from the Koran before executing a hostage" is very likely offensive to the majority of the Islamic world that do not condone and fight against the radicals that so interpret the Koran." Are you new to this blog? (Or is this Fred Bills, the reluctant Kerry campaigner?) My impression is that bloggers here generally consider moderate Muslims to be largely mythological, not real. Maybe I just like Halloween to be more scary than most people. For example, I think this provides a perfectly good Halloween costume idea. Yes, Im serious. Oh, and speaking of hooded guys with wires attached to them, I dont recall the first peep of protest on this blog at the ACTUAL horrors that occurred at Abu Ghraib. Maybe they werent seen as horrors. After all, Claremont-award winning Rush Limbaugh likened them to goofy frat hijinks. But we get someone DRESSING UP like a suicide bomber at a Pennsylvania Halloween party and suddenly folks are aghast, offended, or at least thoroughly indignant. Please. I didnt criticize the students in my previous comment, only the president of a well-respected university for a lack of prudence or, if you dont like that word, public-awareness. The costumes were in bad taste. As is the costume you link to. As would dress as a solider killed in Iraq by a roadside bomb. Actually, this all reminds me of a recent South Park episode where Satan was hosting a costume party. His guests became angered when a man in a costume of Steve Irwin walked in with a stingray jutting through his chest. I think what Satan said applies, "Its too soon." I have serious doubts about your glee for bwahahahahaha scary halloweens. In my experience, age has made the holiday more about satire and creativity than anything else. Im guessing the same has been your experience. But if you admit that, than "taste" would be an issue when it comes to costume selection. Good memory on my true identity. Ive tried sooo hard to keep my painful past shrouded in the dark. Like my candidate before me, I "flip-flopped" to the other side, so my opinions dont really matter anyways. What will I do now Craig? Also, the abuse in Abu Ghraib was horrible and atrocious. Rush Limbaugh is a blow-hard, even if he occasionaly comes up with an interesting and...dare I say it... persuasive argument. No, Im DEAD serious about enjoying scary Halloweens. I like the idea of being scared, but of course, like most people who talk big about it, I like it in a controlled context where I know nothing truly scary will happen, like the guy chasing me with the chainsaw will actually sink it into my neck, or that someone will really hold my head in the apple-bobbin barrel until I think Im about to drown. Im also a reluctant fan of the horror film genre; about 98% of them are unforgivably bad, but that 2% has some real, terrifying gems. That said, Im very open to Halloweens being funny, creative and full of satire, too. The best elements of Halloween may sometimes even find a way to combine all of those aspects. 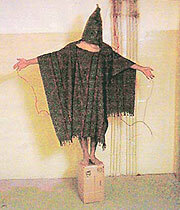 The picture I linked to was an actual pic of the wired, hooded guy at Abu Ghraib, not a costume. Its very important to note the distinction between what is REAL and what is SIMULATED. And be careful, Fred, in applying or following the words of Satan...or Rush. Well said and funny Craig. Sophist, or rhetorical mastermind or both?